Police were called after vandals ripped up the legal plants and tried to smoke them. Landowner Keith Langmead said: “They can smoke it all they like, they won’t get high. Farmer Nathaniel Loxley, 28, said people started stealing his plants after a message was posted on Facebook at the weekend. “This is industrial hemp with no THC content, no psychoactive content. “There have been a few kids trespassing and some theft. “It’s understandable, it’s not every day you see a field of hemp growing. Plants have been ripped up and a path trampled through the field. Cigarette papers and leaves are scattered along the path leading to the field, near . Landowners John Longhurst, 84, and Keith Langmead said the ten acre field was planted in March this year after a Home Office licence was granted to grow legal cannabis. Mr Langmead said they had lost about five per cent of the crop since the post appeared on Facebook. “It was growing quite nicely and we weren’t having any trouble. “We didn’t have any trouble till the weekend when somebody put it on Facebook. “We are getting 15 to 20 kids a day coming in and making a right bloody nuisance of themselves. “They can smoke it all they like, they won’t get high. “If they go down to Brighton or Portsmouth and try to sell it, they’re going to get duffed up. Nathaniel Loxley, believed to be from Arundel, was a specialist in anti money laundering for the Bank of Tokyo before he founded the Hop and Hemp Trading company in September 2014. He described growing the medicinal crop as a cause close to his heart after recent family illness. “Unfortunately, it was too little too late. “It is very good for healing and is an incredibly resourceful plant. The seed is grown to process into oil for medicines and cosmetics. 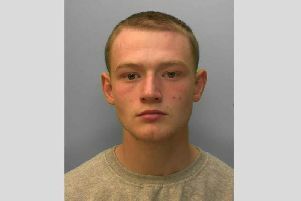 Sussex police said three people were arrested on last night (Tuesday, July 21). “Three men, one aged 30 from Littlehampton, one aged 18 from Angmering and on aged 47 from Ilchester, Somerset, are currently in custody for interview and further inquiries,” a spokesman said. “They were arrested on suspicion of theft of a quantity of industrial hemp which is being grown lawfully under licence in the field. The Home Office confirmed the field is licensed to grow hemp.